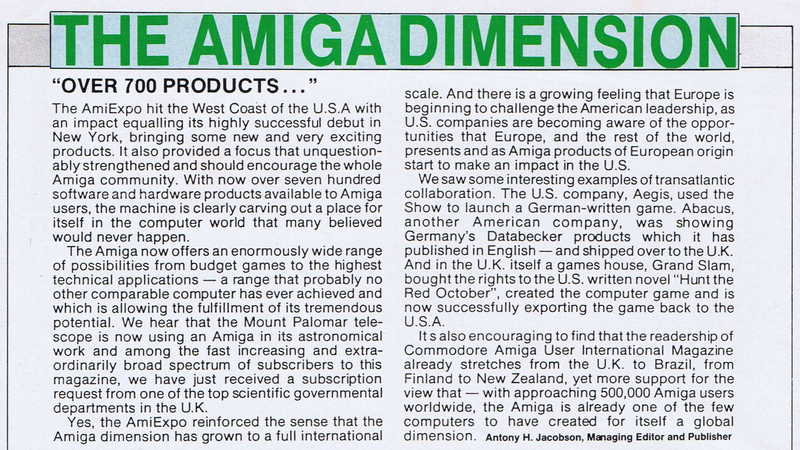 The Amiga Dimension was, in the original printed Amiga User International magazine, an initially short and pithy editorial which was often used to highlight the theme of the magazine for the month, or to comment on current thinking about the Amiga. The first couple of editorials of the independent version of the magazine, which was first published as volume 2, number 1, in January 1988, were penned by AUI’s Technical Editor, Ian Bennett. Subsequently, with Managing Editor and Publisher Antony H. Jacobson firmly at the helm and setting the pace, such editorials generally fell to him, while Ian Bennett became Associate Editor as the staff lineup evolved, and David Ward finally became Deputy Editor towards the final years of the magazine. The Amiga Dimension of the late 1980s-90s still makes fascinating reading, as a topical column, to anyone interested in the rise of the Amiga computer range (and, with the rest of Commodore, its fall), as well as other more general computing themes, so I will be regularly re-publishing selected original editorials from this series here. 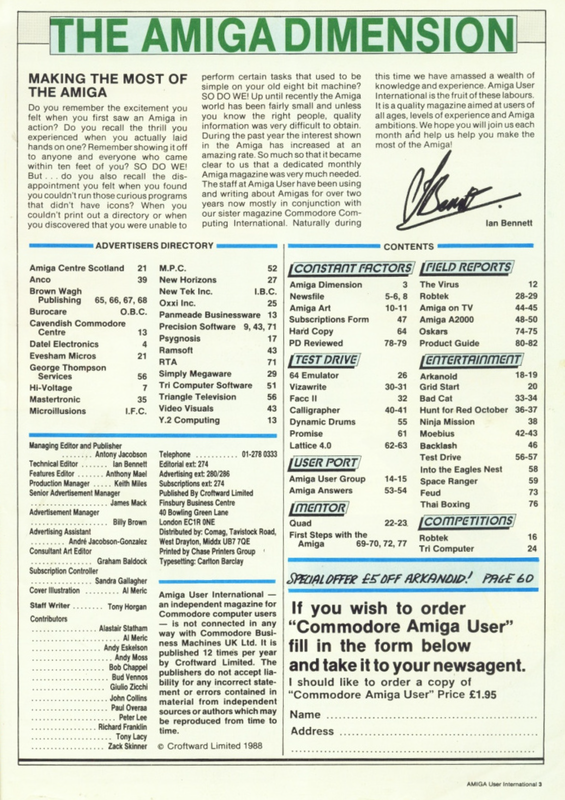 In addition, in tribute to AUI and its editors, and in order to keep this site topical with regard to the current Amiga retro community, as Editor and Publisher of this website I will continue the tradition of writing under under the banner of The Amiga Dimension, both on the front page of this site and in general posts of a similar nature. These new Amiga Dimension posts will generally be found under the category Amiga Dimension, and as the first sub-menu item under Constant Factors. Looking back on those heady days of Amiga User International when the Amiga was king of the home computers, both I and this site have a lot to live up to, but we’ll do our best! I hope you’ll stay with us along the way.